Chris McCord first saw Moving in the Spirit perform over twenty years ago, when he was twelve years old. He was so inspired that he called Artistic Director Dana Lupton every week to make sure he didn’t miss auditions for the following year. After touring nationally and internationally with Moving in the Spirit, Chris graduated from Lakeside High School and earned a bachelor’s degree in business management from Georgia State University and a Georgia Peace Officer certification from the DeKalb County Police Department. He later returned to Moving in the Spirit to found and direct our Summer Camp and Men in Motion programs. Chris is a graduate of the Devos Urban Leadership Initiative. He won the WB Unsung Hero Award in 2005 and Moving in the Spirit’s first Alumni Award in 2007. In addition to his work with Men in Motion, Chris has personally performed for the Cathedral of the Holy Spirit, Studio Dionne, Abundant Life Church and with choreographer Nicole Livieratos. He has also presented as a guest for the dance program at the University of Georgia in Athens. Chris is an active member and leader in the South Atlanta community and serves as the Treasurer of the South Atlanta Community Association while also leading their Tire Clean-Up project to maintain the integrity of the environment of the area. Recently, Chris had the opportunity to travel to South Africa, specifically to work with children in the township of Soweto outside of Johannesburg. In addition, Chris volunteers his personal time with Charis Community Housing, Adopt-a-Grandparent and the holiday party for Atlanta’s Special Citizens. 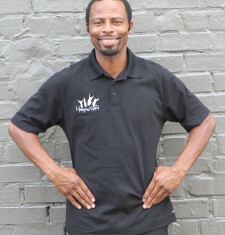 Chris’ story has been featured in the Atlanta Journal-Constitution and Dance Studio Life magazine.